While in New York just a few weeks back, Heather and I had a fan girl moment outside of the Prabal Gurung show when we spotted this stylish lady ducking into a town car. Unfortunately, we weren't quick enough to snap her picture (she's mighty speedy in those pumps of hers!) but as evidenced by the snaps above, I took a few cues from her perfectly styled jacket-upon-jacket look. And you know what, I rather like the results! How about you guys? Try any jacket layering lately? Would love to seem them! Please share your links below in the comments! Also, on a side note, if you haven't already entered my Breil watch giveaway, I strongly suggest you do! The clock is ticking (har, har!). Ooh I love the pants! You always have the cutest cable knits. Makes me want to add some sweaters to my wardrobe. Love the coat, too. Gorgeous. Fun pants and love the coat! love the pink pants!!! - I just got a pair of pink cutoffs... not sure what to match with it... but so cute! Love your pants and necklace! All in all great outfit! i love the shoes and pants!! adorable!!! I love the black trim/cuffs on those pants! How different! You can never go wrong emulating Jenna Lyons! Those pants are so cool, very unique. The options are endless colorblocking at the legs. I love those pants! I haven't tried the jacket upon jacket layering myself since it's just not practical for me but I love the look on others. I loved that you used the inspiration to completely make it your own without copying exactly! Love the outfit and specially the pants!!! Love the pants, very cute!! Love the two-tone pants! I'm going to have to test out the layered jackets! The coolest pants, love the pink and that you added the denim jacket. I've been eying these pants for a while, you may have just pushed me over the edge into purchasing! Those pants are so rad! Great look. Yes,I love that pictures from FW and you did a great job!love the coat! Okay, I'm IN LOVE with those pants. They are rocking my world and need to be a part of my wardrobe. I'm dying! this is FLAWLESS! simply amazing!!!! you make me wish we had cooler weather in miami :(. it is now basically summer here...loving this look. I LOVE those pants w/ the contrast hem - so cool! Gorgeous look! Love the pants!! Many of my jackets seem to be too tight to layer. I haven't gotten the whole art of it down yet. Love your two toned pants! I love the idea of layering with a denim jacket!! I am so envious of you with your NYFW deets! Love this whole look! 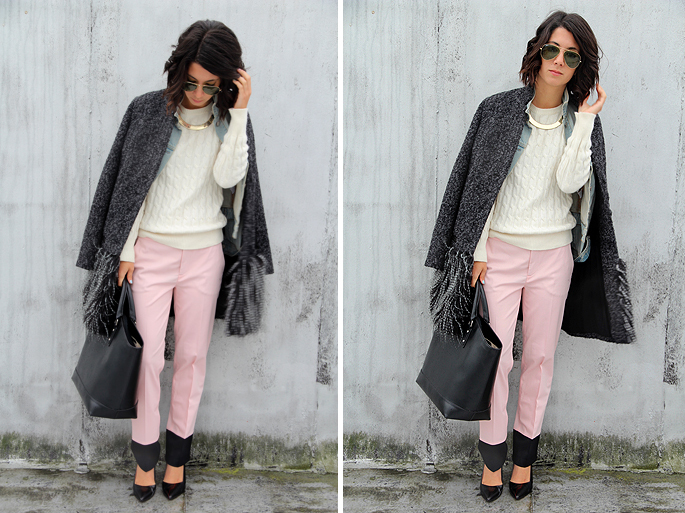 The light pink coloured pants are great for spring! Those shoes are insane too! I live in Denver, I totally understand the doubled up look! I am always cold :( Check out my blog Modern Frank. loveeeee your outfit!!!!! amazing pants!!! Hey there! I love this outfit, although I don't layer much because of the constant heat; here is a post I did layer on. :) http://glofashion3.blogspot.com/2012/02/layer-if-you-like.html Let me know what you think about my blog! That cuff is great on those pants and I love how you mix the spring trends into a winter wardrobe. love this outfit! the metallic necklace and pants are fabulous! this outfit is so so perfect! the pink is the same bubblegum pink as those infamous isabel marant lace up shorts, and the black cuff at the bottom is such a nice touch. The collar necklace is a really great piece too! have not seen pants like that yet. love them. I love those Zara pants. Unfortunately, I can't squeen into their pants as they run small. And I love the trim on that coat!! The sweater looks so comfortable! Also love the jean jacket and coat together!! Love your look!! The necklace is amazing... love the color blocking on the pants and the jacket layering is perfect!